• Captain Zoom® sings the person’s name 8 times! • Spell the person’s name any way you like once you download and save the file. Please download and save the MP3 to your computer immediately after your order is processed. 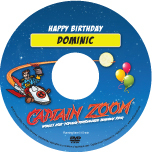 New Feature - Burn your own Captain Zoom CD. Add the CD Label and Sleeve Kit to your MP3 at the time of purchase for $3.95. 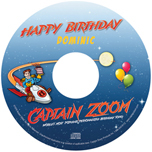 You'll receive an official Captain Zoom personalized CD label and protective sleeve. The kit will be sent prepaid by first class mail.